If you have used lollipop version of android you see a nice ripple effect on button clicks. 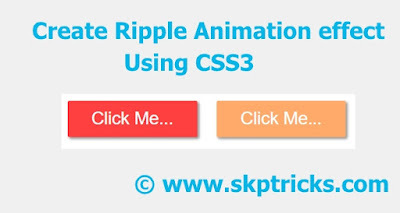 This tutorial is about achieving similar result, the CSS ripple effect on button clicks. Lets see the complete example to create ripple effect on button clicks. This all about the ripple effect on button clicks. In case of any queries please do comments in comment box below. add webkit property to css property, then it will work.